7. Designing the framework: ready … get set … go!! The increasing volume of information in the contemporary world entails demand for efficient knowledge management (KM) systems; a logical method of information organization that will allow proper semantic querying to identify things that match meaning in natural language. On this concept, the role of an information manager goes beyond implementing a search and clustering system, to the ability to map and logically present the subject domain and related cross domains. 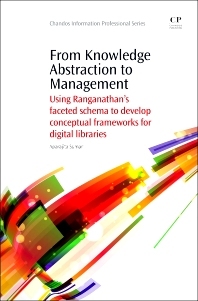 From Knowledge Abstraction to Management answers this need by analysing ontology tools and techniques, helping the reader develop a conceptual framework from the digital library perspective. Beginning with the concept of knowledge abstraction, before discussing the Solecistic versus the Semantic Web, the book goes on to consider knowledge organisation, the development of conceptual frameworks, untying conceptual tangles, and the concept of faceted knowledge representation. Aparajita Suman is Senior Advisor, Knowledge Management, with FHI 360, Improving Healthy Behaviors Project, India. With expertise in planning, setting up and managing specialized communication and information services, she has wide experience of helping organizations use knowledge and communication to achieve their goals. With over a decade of experience, Aparajita has built strong KM and communications systems using a combination of people, processes and technology in the private, national and international, government institutional, and UN sector. Aparajita teaches on courses, presents papers and conducts training programs in the areas of KM, Communications and Intellectual Property Rights, all with a passion to teach. She speaks at numerous conferences and associations.